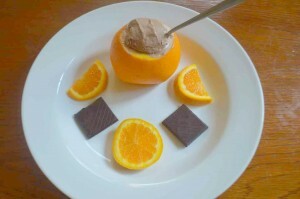 This dairy free ice cream has a nice combination of orange and chocolate flavors and is sugar free, and is served in cute scooped out oranges. The flavors are really light and refreshing. You can use either birch xylitol or raw honey for the sweetener. The vodka is optional but will give any leftovers a better consistency when frozen. This dairy free ice cream has a nice combination of orange and chocolate flavors and is sugar free. 2 Oranges for serving containers. Place the coconut milk, cocoa, orange extract, vodka and sweetener into the blender. Pour the mixture into the ice cream maker (This is the one I use). Cut off the tops of the oranges and scoop out the fruit. Spoon the ice cream into the oranges. Ice cream, especially Paleo ice cream, is my “day job.” Your recipe looks great! 🙂 I used to only like chocolate by itself; but now I LOVE it with orange or berries. Thanks for sharing! This sounds wonderful, but one thing really should be changed; since there is no dairy in it, it technically cannot be called ice CREAM. Other than that, it does sound fabulous; I love orange and chocolate together! Thanks, I hope you like it. It does have the words Dairy-Free in the title.